The feature (shipwreck) on a chart whose data has been “cleaned” and finalized. “Wk” stands for wreck on the chart. 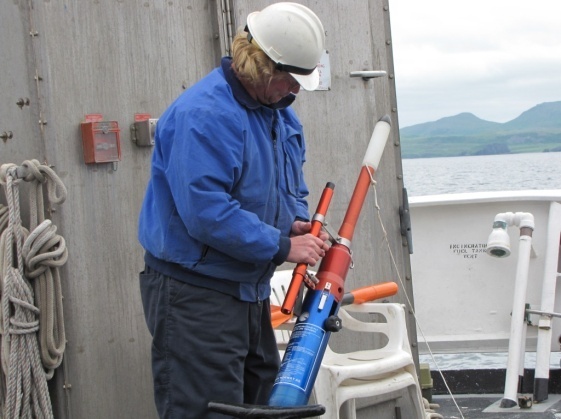 Throughout the day when you are on a launch collecting hydrographic survey data, there are terms and concepts that come up repeatedly—namely, low vs. high frequency and resolution. The multi-beam sonar on the launches has dual frequencies—high and low. This, combined with the fact that there are multiple beams instead of just one “pinging” off of the ocean bottom, allows the hydrographer to customize the technology for the conditions of the day. Low frequency is used in deeper water. The multi-beam is operated in high frequency in shallow water. According to my Hydrographer In Charge (HIC) on a recent survey, Barry Jackson, the depth at which you would change frequencies is about 50 meters. Low frequency sends out fewer pings per second, but low frequency sound travels further through water. Conversely, high frequency sends out more pings, but high frequency sound does not travel as far through the water. Therefore, high frequency gives you an image that is more precise. Why would you want a higher quality image in shallower water? As a navigator, it is important that the obstructions and underwater features closer to the surface be the most clear, for those are the ones that you are most likely to hit. The day’s polygon (or survey area) data is also configured to be collected at a certain resolution. Resolution, like frequency, affects the detail of an underwater feature. The resolution also depends upon the depth of the water; however, there are more choices. On Rainier, the resolution changes based upon depth at the following increments. (On this mission, 4m resolution is the least.) Note that there is some overlap. 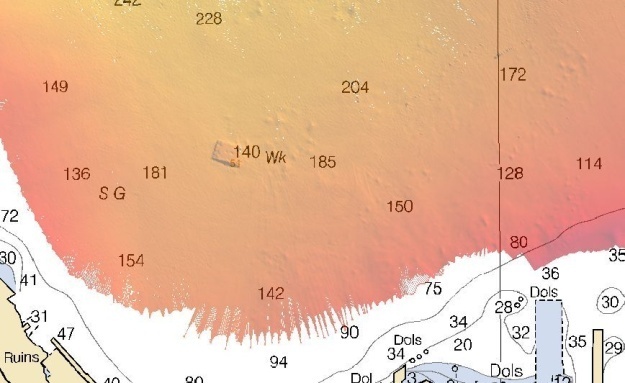 To demonstrate how applying different resolutions to the same feature can change how it is viewed, ENS Christy Shultz showed me the bathymetry (the topography of the Earth’s surface underwater) of a shipwreck surveyed in Elliot Bay, near Seattle, WA. If you look at the corrected data for the object at 4 meter resolution and compare the same image at 2 and 1 meter resolution, you will see that as the resolution gets higher (the number actually gets lower), the image goes from being fuzzy to quite clear. Chief Boatswain Jimmy Kruger demonstrates how to use a line-throwing device, the PLT. There are some days when I do not go out on a survey launch. These days are great for taking a peek around the ship to see what happens in different departments or to have safety drills and demonstrations. Recently, we had the second of our weekly abandon ship and fire/emergency drills. After the drills, the entire crew who was on board (not out on launches) watched a video clip about a piece of rescue apparatus called a PLT, or Pneumatic Line Thrower. Then we all went to the fantail for a demonstration. The PLT is a rescue device that a ship can use to get a line out to another ship or individual in distress. It uses compressed air to fire a line attached to a rocket-shaped weight. The demonstration and overall design of the PLT reminded me of a piece of historical rescue equipment familiar to many who live on Cape Cod, MA and other coastal communities–a Lyle gun. 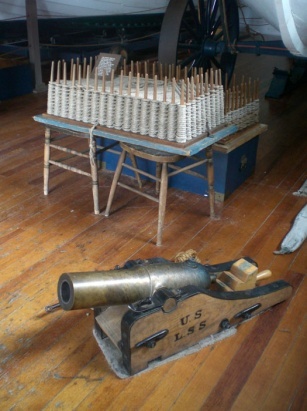 A Lyle gun is a small cannon that was used by the U.S. Lifesaving Service in the late 1800s to fire a lightweight line onto the mast of a sinking ship when conditions were too severe to launch a surf boat. When the line was secured, a paddle-shaped board that contained instructions, a block and pulley and heavier lines were sent across. After the line was secured to the mast, the lifesavers would assemble a breeches buoy to haul the sailors to safety across the raging seas. The breeches buoy was a large pair of canvas pants (breeches) secured to a life ring. A pulley system allowed the lifesavers to transfer one man at a time from ship to shore. You can read more about lifesaving, the Lyle gun and breeches buoy here. Rainier is like a small, self-contained floating city. She generates her own power, treats her own waste water, and makes her own drinking water. The ship is only limited by the amount of food and fuel on board. As I noted in my Ship’s Log #2 on July 10, Wosnesenski Island has a herd of feral cows roaming its treeless hills and valleys. Since then, I have been given more information about them. The original bovines were probably brought here by the Osterback family in the early 1900s. The family lived an isolated lifestyle, raising blue fox to trade their pelts to London furriers. You can read more about one of the nine Osterback children, Lily, here. One Saturday evening, the CO (Commanding Officer) granted shore leave for a beach excursion. 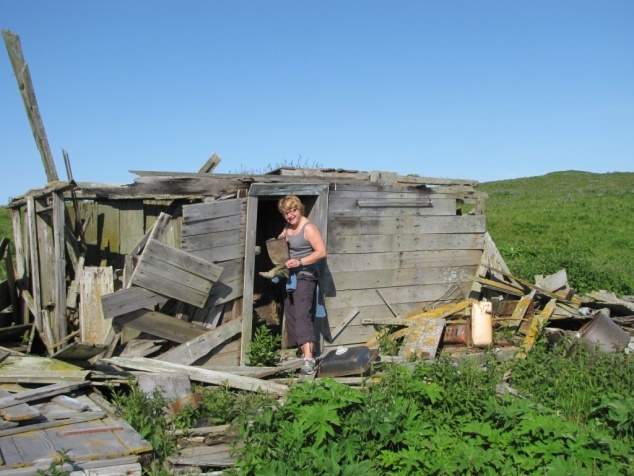 My fellow TAS, Dan Steelquist and I found what is, most likely, left of the Osterback homestead on Wosnesenski Island. This entry was posted in 2009, NOAA Teacher at Sea, Stacey Klimkosky and tagged CTD, Hydrographic survey, life saving device, lyle gun, multibeam sonar, noaa ship rainier, pavlov islands, polygon, seafloor mapping, shore leave. Bookmark the permalink.